Federal Minister for Agriculture David Littleproud is demanding State Governments increase trespass laws and penalties after another animal activist invasion, this time at Lemon Tree feedlot near Millmerran on Queensland’s Darling Downs. A scene of the farm invasion from a video posted on the Animal Activists Collective Facebook page. 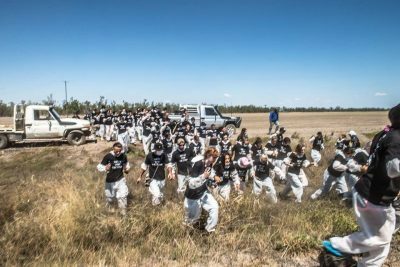 Police were called when 100 animal activists invaded a feedlot and dairy, which is listed on the Aussie Farms activist attack map. The Queensland Police told Beef Central that officers from the Millmerran and Dalby stations responded at 11.45am on Saturday to reports that approximately 80-100 protesters had arrived at the feedlot. A QPS spokesperson said the protestors entered the feedlot, took photographs of animals and then left the site. “No damage was sustained, there were no injuries or threats and therefore no arrests,” the QPS statement said. Queensland Police also told Grain Central they are investigating a related incident in which a van driven by a group of activists had its tyres slashed by an unknown motorbike rider without registration plates. A 20 minute video posted to the Animal Activist’s Collective Facebook page recorded by one of the group members shows about 150 people wearing “Meat is Murder” T-Shirts, many with faces covered by white dust masks, trespassing onto private property and then entering and walking around the feedlot, and directing hostile comments towards feedlot owners and employees. The trespassers’ shirts also carried the message: “one has a moral responsibility to disobey unjust laws”. Mr Littleproud said the onus is on the States to create serious penalty for trespassing on family farms. “For police from surrounding towns to be called to protect farming families is a waste of resources, a broader public safety issue and an absolute disgrace,” he said. “Animal Welfare groups have lost their social licence. They have no moral compass when they are prepared to intimidate innocent Australians and their actions taints their own cause. “Aussie Farms can no longer pretend its map is anything but an attack map for activists, as I’ve been saying for months – this is the second invasion onto a property listed on their map in recent months. “The slaps on the wrist being handed out to animal activists invading family farms is encouraging them to escalate their efforts. A real deterrent is needed before someone gets seriously hurt or killed. There are children living on these family farms. “I again call for calm from all involved. “Vegans eat plenty of farm produce and I respect their right to be vegan. “However nobody has the right to trespass onto people’s family properties. “Nobody would like to see a stranger show up at their residence where their children live and I’m genuinely worried there will be a serious incident. “We’ve seen utterly ridiculous penalties handed out to trespassing and thieving animal activists in the past few months. “Today’s incident follows the $1 fine issued over the Gippy Goats invasion in Victoria, and a $200 fine to a Sunshine Coast offender who trespassed at a piggery – she received less for the third offence than she did for the second. ILLEGAL trespass by 120 activists on a Queensland feedlot property on the weekend raises serious questions for the beef industry and agriculture in general, the Australian Lot Feeders Association said in a statement this morning. As reported in this separate item published earlier, an animal activist incursion took place on Saturday, when 120 activists stormed the family-run Lemontree feedlot near Millmerran on Queensland’s Darling Downs. In its statement, ALFA said it was working with the Lemontree feedlot’s management team. The Queensland Police Service, which attended the feedlot during the incident, had also been engaged by the association. 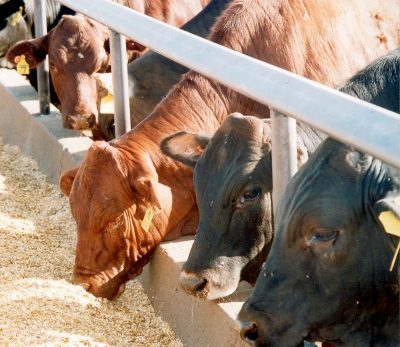 “The Australian feedlot sector and the Australian Lotfeeders Association promotes adherence to the highest animal welfare standards,” it said. “As an industry, we undertake extensive research to inform best practice, with feedlots employing trained animal health staff and qualified nutritionists and veterinarians to ensure the health and welfare of livestock is a priority. “The nature and circumstances of this incident – illegal trespass – raises broader questions for our industry and the agricultural sector. This type of behaviour from some animal activists is reckless, is distressing to farmers, feedlot operators and their families. In addition, it poses serious safety, animal welfare and biosecurity risks,” ALFA said. “The recent publication of the locations and personal details of family farms and feedlots by activist group Aussie Farms has led to multiple instances of illegal trespass. It has left many of our hardworking Australian family farmers and feedlot operators feeling intimidated and threatened,” the statement said. “As an industry, we understand members of the community may have questions about animal welfare and livestock production and we welcome these inquiries. However, the type of intimidation and illegal behaviour from minority activist groups such as those witnessed over the weekend needs to be addressed by all levels of government,” the statement said. ALFA said it welcomed agriculture minister David Littleproud’s call for state governments to increase trespass laws and penalties. “ALFA is proud of our world-leading initiatives including the independently audited National Feedlot Accreditation Scheme – a quality assurance system which drives best practice standards across the industry,” it said. AgForce has called for aggressive animal activists who illegally enter primary enterprises like feedlots and farms to be subject to the full force of the law, saying it was only a matter of time before one these dangerous stunts ended in serious injury or death. “Farmers are good, kind-hearted people just going about their daily business of feeding Australian families. They treat their livestock humanely and they look after the health of their animals,” he said. “Clearly these extremists don’t feel deterred. How could you with those sorts of fines?